Thousands of new residents are set to move into many new developments across the south of the Greenwich Peninsula in coming years. Some new builds are now almost complete with occupation beginning within months. Yet what will greet them is a masterclass in anti-pedestrian design. My last post covered the many new developments at the southern edge of the Peninsula, and whilst there I also looked at the links between the new developments and the older, more established parts of town. I walked between the new developments at Greenwich Millenium Village to Southeastern’s Westcombe Park railway station – which is seeing high increases in passenger numbers, averaging about 6% per annum. Ikea will be built here soon. Aside from developments now completing at GMV, additional blocks are due to start construction located closer to shops, stations and bus routes. 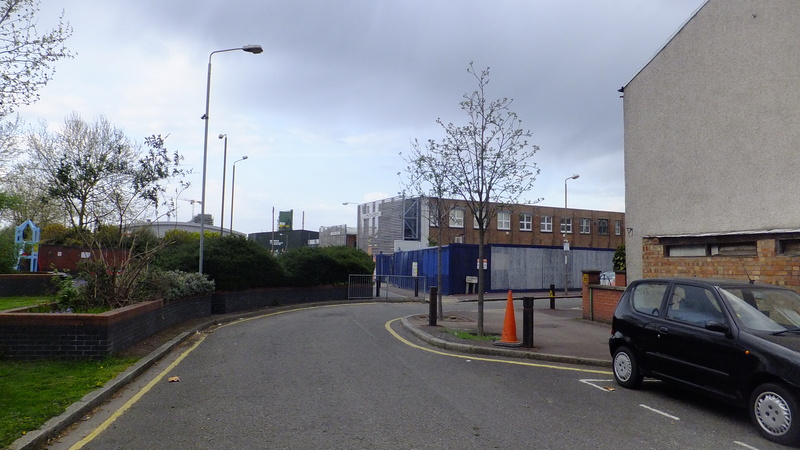 Over the road from GMV a 1,640 pupil capacity school is planned with minimal car parking and a planned catchment area stretching to Woolwich and Thamesmead. For new residents better links south will be important. Many will hopefully head south to reach the many shops, restaurants and pubs in East Greenwich and give them greater custom. There’s also the new leisure centre and library nearby which is due to open very shortly at ‘Greenwich Square’. And then there’s Westcombe Park station to the south with fast links to central London in one direction and major towns such as Woolwich in the other direction before heading onto Kent. It’s closer to the new flats than North Greenwich tube so a walk to the station will be a likely route for a sizeable number of people. Below is a map showing how much closer the train station is. Many new residents are expected to use the tube. That may be the case initially, but in time more will try the train. If residents work in the City then the train is quicker, with Cannon Street about 15 minutes away from Westcombe Park station. Frequencies are good too with a train every 10 minutes at most times and it’s cheaper for a season ticket to central London. But getting to the station and amenities in East Greenwich is far from a pleasant walk. It starts well. 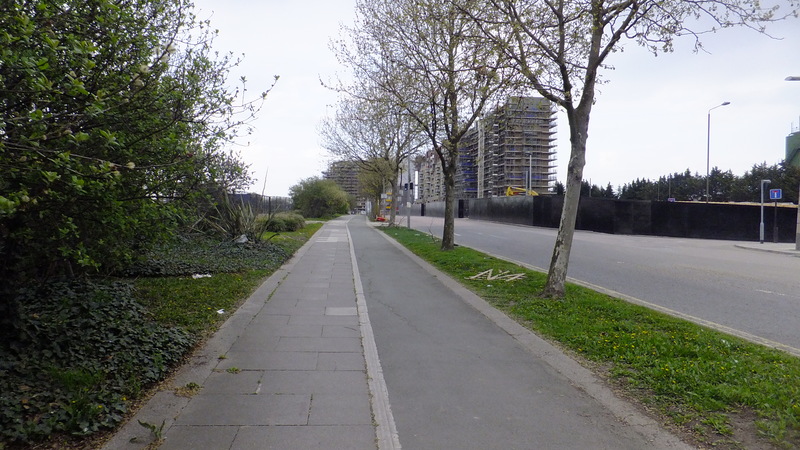 Paths and dedicated cycle lanes directly beside new developments are very good. These date from the original network installed for the millennium celebrations. 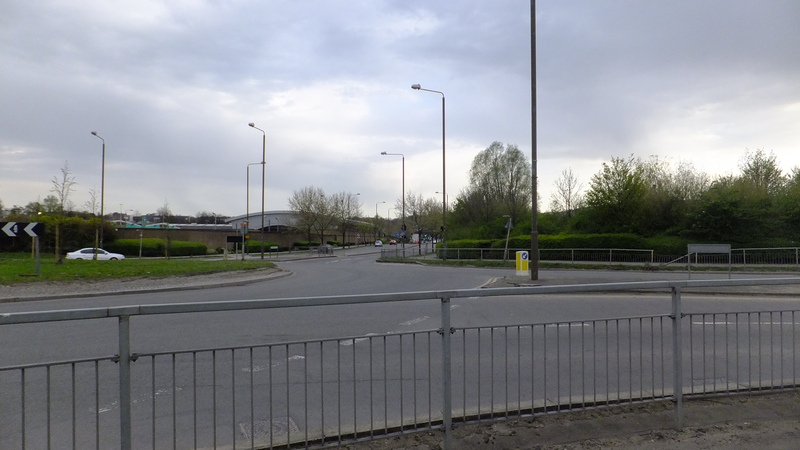 The first problems occur at the roundabout where Bugsby’s Way meets Peartree Way. The roundabout is huge. Approaches are lined with much guardrail. Crossing therefore means a pretty long detour for pedestrians from direct routes. 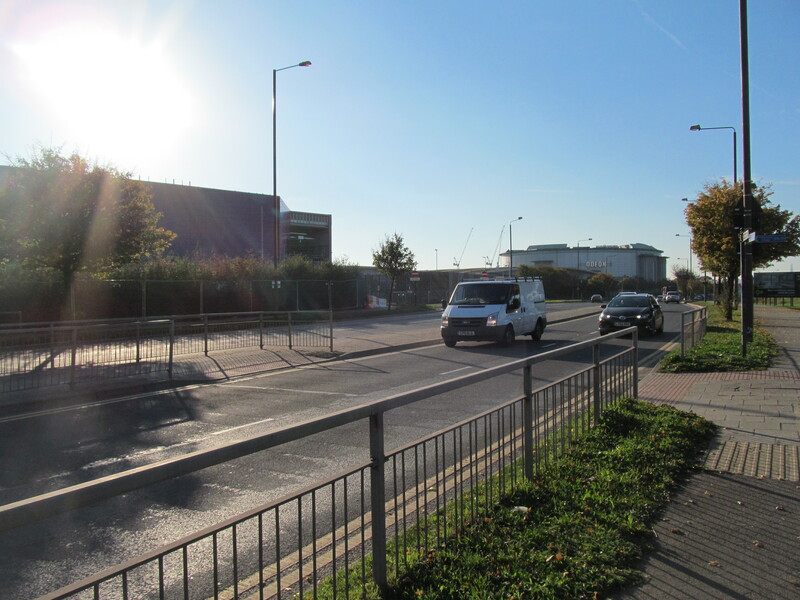 Heading south and the junction by Sainsbury’s (and in future Ikea) presents yet more guard railing forcing pedestrians on detours if they want to cross. 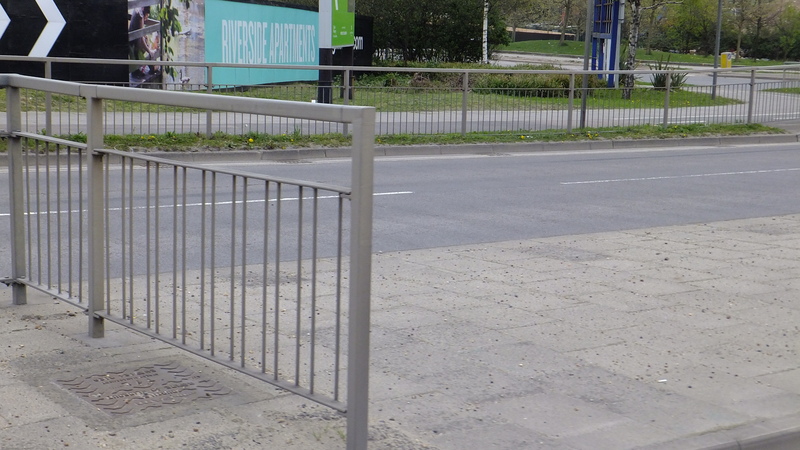 Pedestrians are an afterthought, forced to-and-fro from the adjacent road by guardrails, raised planters and landscaping designed to push them away. And the constant back and forth makes working out the route ahead difficult. Legibility is no consideration. If you didn’t know better when walking at the spot below it looks as though you’re reaching a dead end and unable to head forward to reach shops and the station. So people look to cross over the road on the right. But this means going towards the busier Sainsbury’s car park entrance roads rather than Horn Lane. Residents will eventually work it out if they’re not completely put off walking this way but irregular visitors may wonder where to go. Legible it ain’t. You actually can go straight ahead but forced away from the roadside. The path could have continued straight ahead directly adjacent to the road instead of being grassed over. This would be quicker and clearer for those on foot. The other path would still exist if people prefer not to walk beside the road. Why spend a couple of grand ordering and installing these railings? Pedestrians are forced on more detours here which hampered progress. TfL may be in charge of this section of road directly below the flyover, but if that’s the case then Greenwich council may still be to blame for this mess. 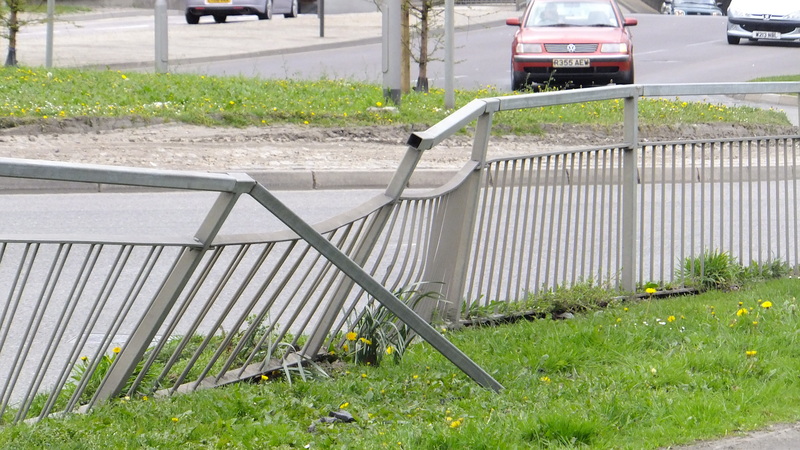 TfL have removed much guardrails on their road network and encourage its removal in street management guidance to councils. It is often only retained if the local authority insists. Its retention here could be due to this. Compare this to Bow flyover. Though TfL’s work has caused numerous problems for cyclists there, the general appearance and pedestrian experience is far better. No guardrails, decent paving and a bit of greenery (which isn’t an obstruction) has been introduced. 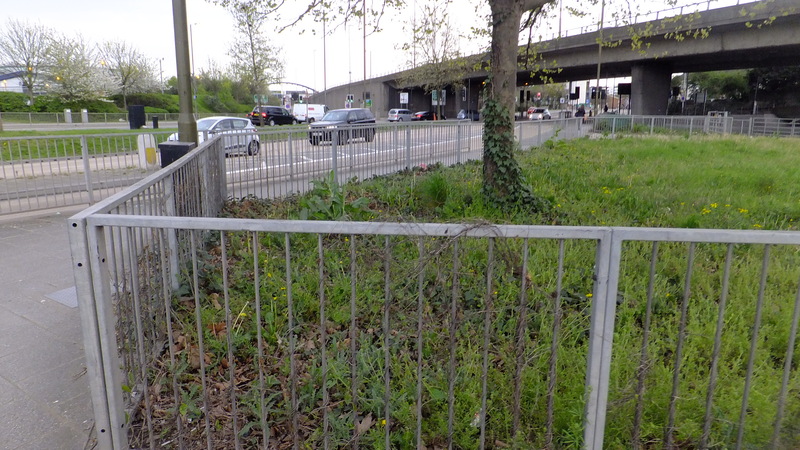 Over in Greenwich and this off-putting path below is on one side of the roundabout. Again clutter obscures the path ahead. This is not enticing or inviting. Open up the space, make it legible and clear what lies ahead. Signage should also be much better. The annoying thing about this whole walk (which is only about 10 minutes) is that it should be a well-used link yet is made unnecessarily difficult and obstructive on foot and I wouldn’t like to try it on a bike. Yet despite this grim walk and the constant diversions, with pedestrians seen as an inconvenient problem, it’s still quicker than heading to north Greenwich station. 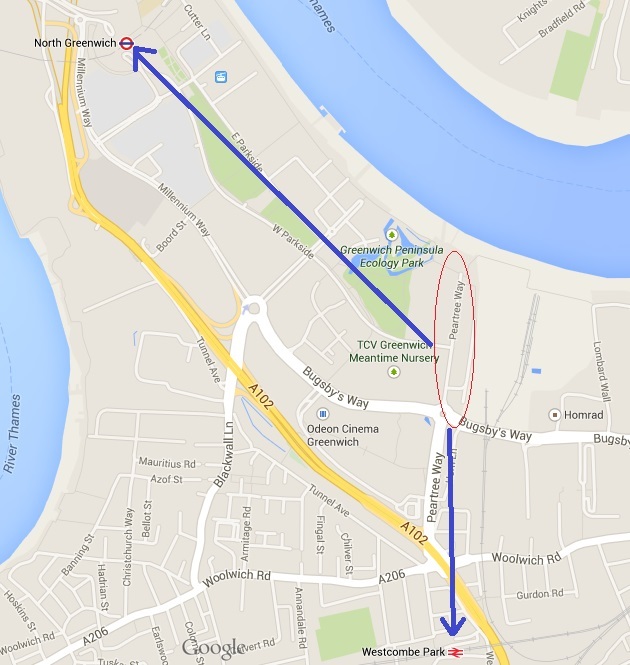 I’m not saying most newcomers will use the train or head to east Greenwich’s shops at first. They’ll probably know all about the tube and go to eat elsewhere. But they will begin to hear about local good little independent places to eat nearby, want to visit the leisure centre and use the rail service, amongst other things. Currently the walk is made as unpleasant as possible so some won’t bother, or they’ll possibly get in a car. And that’s a big failure of street design – if many newcomers don’t feel the walk is pleasant or safe they won’t frequent local businesses. With a modest sum of cash and ditching dated thinking from Greenwich’s Highways Dept this could be so much better. A new Ibis hotel has just begun construction nearby and visitors will almost certainly be walking under the Blackwall approach, and they’ll be far from alone in doing so, particularly as developments like Enderby Wharf finishes. It’s a real shame to see so many large developments nearing completion across a wide area and knowing millions have flowed in from Section 106 payments that should have funded improvements, and yet seeing nothing done. I’ve started a flickr account related to the blog. There’s so many design flaws and aesthetic horrors I’d like to include but I just can’t cover all of them in a post. Similarly, there’s too many shots of new developments to include in most posts so I thought it would be useful to put them on Flickr so a wider range can be seen. 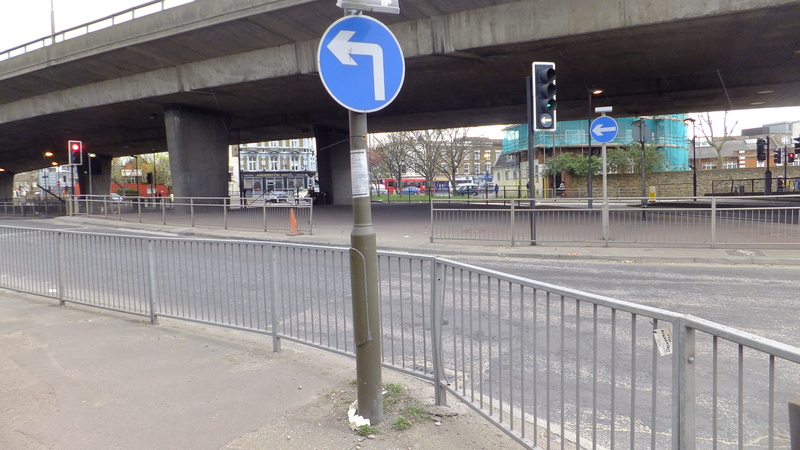 Without a lot of detail – everyone seems to agree that the roundabout and the area needs a redesign but fragmentation of ownership and TfL’s priorities seem to make it difficult. It is also frequently not easy for residents to engage with TfL. 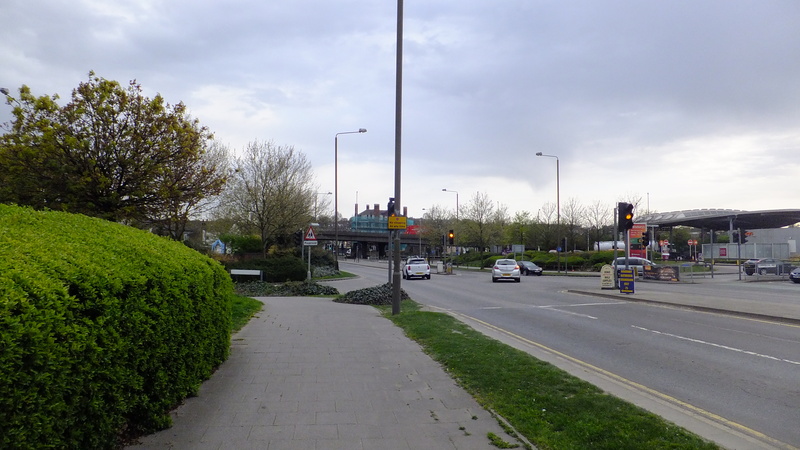 I was always told – by people outside of the various authorities – that the addition of Peartree Way onto the roundabout in the late 1990s has caused many of the current problems. When I was first involved around 2003?? 2004?? – and my memory is a bit hazy on some of it – TfL had designated a circuitous pedestrian route which ran through the centre of the roundabout and erected barriers to stop people doing anything different. People who wanted to get to Sainsburys were climbing over the barriers on the northern slips – lifting over parcels and babies. One particular resident (nameless of course) was coming out with bolt cutters in the early hours. I had the impression then that it was always TfL who replaced the barriers he had cut down – but I may be wrong. 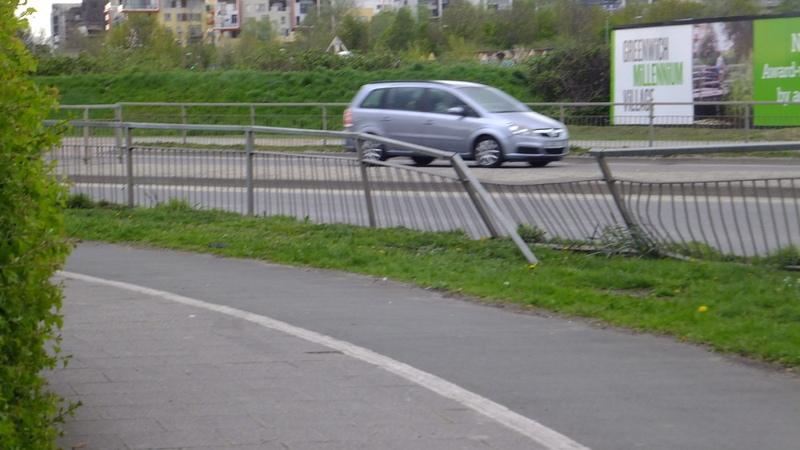 TfL’s concern, I was told, was to stop vehicles coming off the motorway on one slip and returning to it on the another – and that the whole barrier system had been set up to prevent this. The ones around the centre were to protect workers who might have to work in the central island. 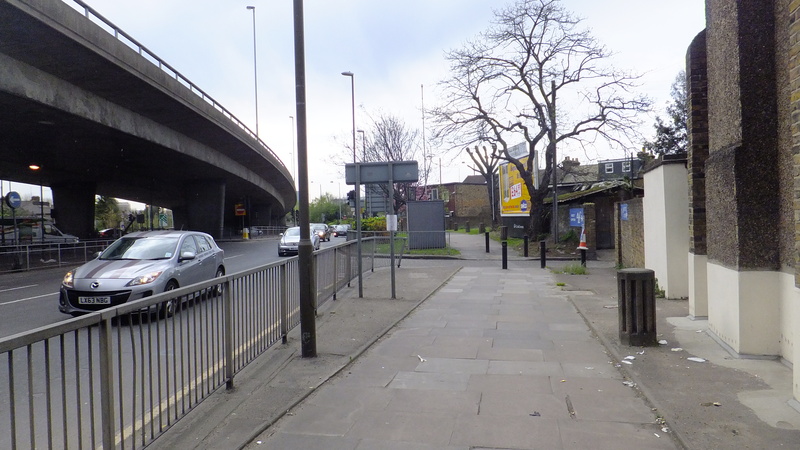 I was told that only after a lot of pressure did TfL agreed to put in the pedestrian crossing now in place across the northern slips to allow pedestrian access to Sainsburys. 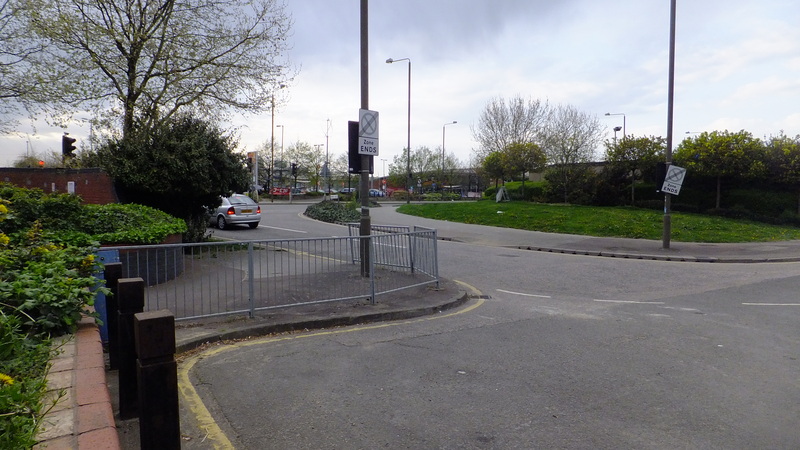 I am only going on about all this because I think it illustrates some of the problems with the roundabout and the area around it – and the different priorities of the various authorities involved – not to mention those of residents. As a small codicil, some years later, thieves climbed over the central barriers and pulled newly laid cable out of the ground. 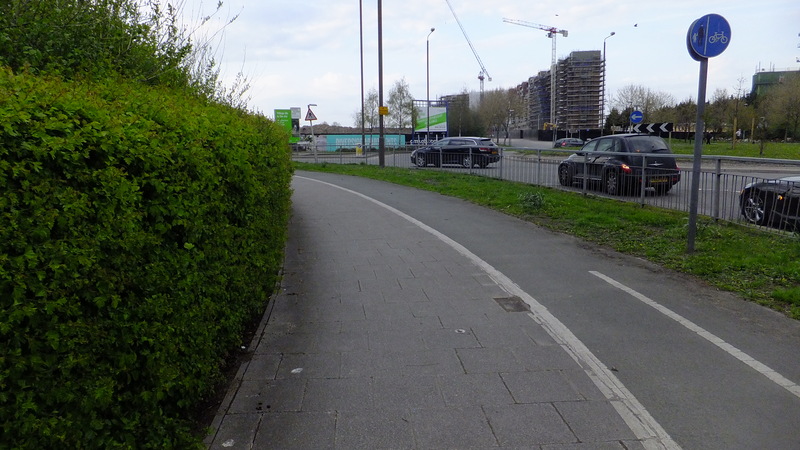 The bit above is of course about the Woolwich Road roundabout – and you will be relieved to know I am not going to add in a lot about the rest of the route and the big Bugsbys/Millennium Way roundabout (although I could). There is however another lot of complicated ownership and responsibility issues around the whole area you have been walking. You should – in many ways that’s the more intriguing bit. Installed around the same time as Peninsula roads so late 90s? 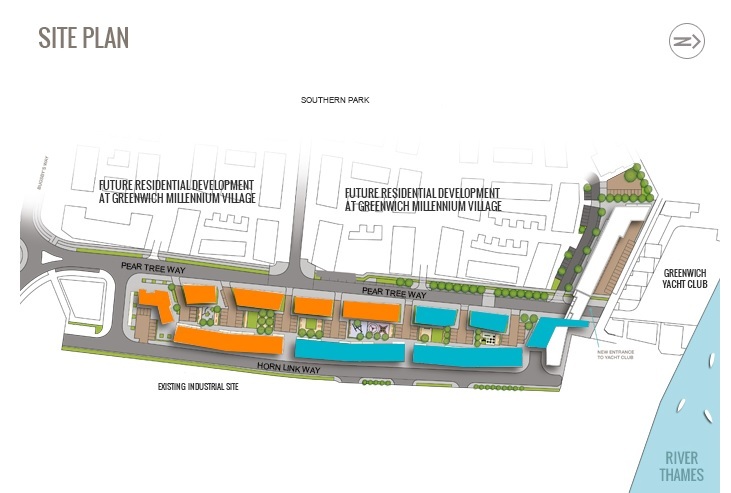 If so its odd how they got so much right by GMV but so wrong just south, despite knowing housing would extend that way. The roundabout and flyover completely blight the area. Maybe both should just be demolished!